Due to the sheer number of drivers on the road, car accident claims are one of the most prevalent types of insurance claims. Speed, distractions, intoxication, fatigue, running red lights, making unsafe turns, and general irresponsibility and disregard for traffic laws account for the majority of accident causes. One type of accident that’s often caused by these acts of driver negligence is the rear end collision. The rear driver is almost always considered responsible for rear end collisions, and will be held liable for damages as such. However, before damages can be recovered, you’ll have to prove the liability of the at-fault party. If you are injured in a car accident, you are entitled to recover damages from the responsible party. To do so, you must prove that the at-fault party acted negligently, and that the negligence caused the accident. Proving negligence is a process, and requires establishing that the other motorist owed you a duty of care (which is implied in car accident claims), that the motorist breached that duty by acting in a manner that would not be considered reasonable or rational (following too closely, drinking while driving, speeding, etc. ), and that the breach was the proximate cause of the accident and your injuries. You will also have to substantiate the extent of the damages that you suffered. Above, it was stated that proving that the other motorist owed you a duty of care is implied in car accident claims. This is because in Massachusetts, all individuals who operate a motor vehicle have a duty to exercise ordinary care in that operation, i.e. obeying traffic laws and exercising caution based on driving conditions. Maintaining a safe distance, driving sober, and following traffic laws are all examples of the ordinary—or reasonable person— standard of care. Because most rear end collisions are caused by the rear driver’s negligence, such as speeding or following too closely, liability usually lies with the rear driver. While the rear driver is almost always held liable for damages in a rear end collision, there are some circumstances when the front driver—you—may be held responsible or partially responsible. This may occur if your rear brake lights/taillights were broken, making it difficult for the rear driver to notice that you were stopping. If you were driving at a slow speed that could be considered unsafe, you may also be considered at fault for your rear end collision. Sometimes, fault is not assigned to either party. If weather conditions are poor, a defect in the road leads to the accident’s occurrence, or another driver’s actions cause the accident, then a third party liability claim (a claim that does not involve either driver) may be sought by injured parties. Witness statements, police reports, physical evidence, and video footage can all be used to help determine fault in a rear end collision. If it is determined that the driver who hit you is at fault for the accident, but not totally at fault, then your claim may be subject to Massachusetts contributory negligence laws. Under these laws, you can only recover compensation if your degree of causal responsibility was less than 50 percent; if 50 percent or more, you are barred from recovery. If less than 50 percent, but more than zero percent, then your award amount will be diminished by your percentage of fault. For example, if you were 40 percent at fault for your accident, and if you were attempting to recover $50,000 in damages, you would only be able to recover 60 percent of the $50,000, or $30,000. Many injuries that result from rear end accidents are soft tissue injuries, meaning that the stretching or tearing of a muscle, tissue, tendon, or ligament has occurred. Typically, these soft tissue injuries are focused in the neck and the back, and are caused by the forces of accelerating and then decelerating during the collision. First, the neck and back are forced backward upon rear impact; then, they are violently thrust forward. This can cause a plethora of injury types, such as whiplash or a herniated disc. Head trauma may also occur, particularly if a seatbelt was not worn at the time of crash or if other objects in the car made impact with the skull. Healing these injuries may require significant medical intervention, and can take months until full, or mostly full recovery. Sometimes, a victim will live with their injuries for the entirety of their life. Demonstrating the severity of your injuries is extremely important in recovering the compensation amount that you deserve. 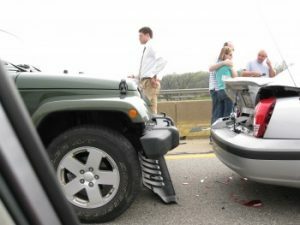 A car accident attorney can help you gather the medical evidence and expert testimony required to do this. In the event that the car accident results in severe disability or loss of function, your spouse may be able to bring forth a claim for loss of consortium. Punitive damages are damages that are paid based on the defendant’s gross negligence, and are only available in Massachusetts when an accident results in death. Determining fault in a rear end collision may not be as straightforward as it initially appears. To ensure that you have the best legal representation on your side to help you prove liability and recover the damages that you need to pay for your losses, call the Boston car accident attorneys at The Law Offices Burns & Jain. Call us now at 617-227-7423. We have operators 24 hours a day.